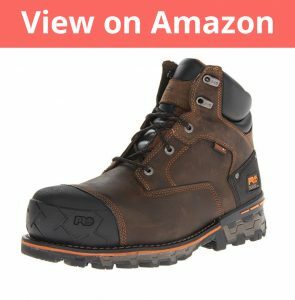 10 Most Comfortable Work Boots & Best Work Boots 2018 – Comfort and Support are Key! Why would you give someone the boot? Granted, they might deserve it. They might be bad workers, or rude, or need to be fired ASAP, but.. Why a boot? Good boots are so incredibly hard to come by. Did the person who coined the phrase have an entire shoerack on hand, or something? Silliness aside, the fact remains that it really is very difficult to find a work boot that pays for itself in time. Most of the boots in this category are flimsily rubber soled, or hastily cobbled together, with a name brand slapped on top. In fact, because of aggressive advertising and open-ended ad campaigns, a lot of people end up assuming that hiking boots could pass off as work boots too- which could not be further from the truth. 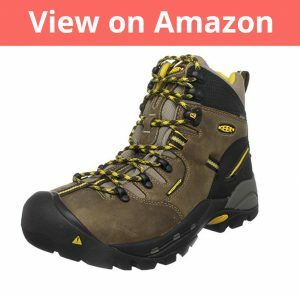 Hiking boots, while admittedly more durable than a regular set of boots, still do not even begin to approach the kind of longevity and durability a good pair of work boots has. Some of the most comfortable work boots are even more comfortable than most hiking boots out there surprisingly. Work boots are designed to be heavy duty, because they are worn on active sites, not just on terrains or trails. Even if the other details get muddling, the weight of the work boot itself should clear things up for you. Work boots are usually heavy – and significantly heavier than hiking boots or other boots. 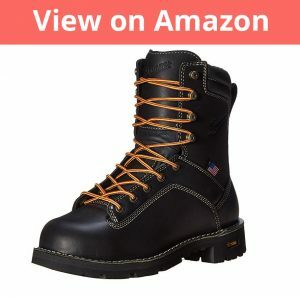 They need to be, because steel toes or steel caps, or any reinforced metal cap, is a staple feature in standard work boots. If not a metal cap, then lighter boots often have a toe cap made or rubber, or any other reinforced material that strong enough to prevent or at least lessen impact on the toes. This strength feature extends to the material of the boot, too. Good work boots need to be rigid. They are not made for long distance use, rather, for endurance and protection against working site accidents. The material should be tough, rigid, and unyielding, with just a little bit of flexibility in there, for added comfort. This also extends to the sole. Work boots will not give you traction anywhere on the level of a hiking boot, because they don’t have a lugsole. However, good work boots do have some added texture on the sole or the outsole, for providing a good grip. That suffices to provide grip even on wet or somewhat slippery surfaces. The main goal, though, is to have a work boot that can keep your feet safe from piercing or crushing injuries, as far as possible. So what else do you need, to put a good and hardy work boot together? Well, one of these. If you’re a first-time shopper, going through the comparison will help you pick. And even if this isn’t your first Rodeo, you might still see some features that beat your favorite- unless (and most likely), that’s on this list, too. Phew! That’s some list! But that’s only the names. Let’s dive right into what each pair features, and doesn’t. All the better for you to find the perfect pair with! Right off the bat, the Timberland PRO Boondock Work Boot is a formidable feature on any tally of work boots. It’s visibly strong and can take quite a kicking. The brand itself is the first voucher for quality, as if the features were not enough to tilt the scales in its favor. Here’s a breakdown of what this work boot brings you. Comfort and Design – The Timberland PRO Men’s Boondock Boot is made of leather, with a synthetic sole. The shaft is 6.5 inches from the arch, which may be a little higher than the usual with standard work boots. The boots are lace up and noninsulated, which is actually an option- an insulated variant is also available, if that’s a requirement. The front of the boot has a composite safety toe, specially stated to have a contrast padded collar. The eyelet apertures are silver toned lined, which admittedly adds a classy touch of color contrast to the otherwise darker boot. A special mention in the design is the fingergrip pull on feature, which makes the boot very easy to put on. Another is the Anti-Fatigue Technology comfort system. The structuring of the boot lets impact on the sole of the foot be redirected, so that the energy absorbed gets transmitted back under the arch of the foot, making movement a lot easier, even over uneven ground. Shock absorbing cones are placed in the sole of the boot, which shrink and expand, relative to the impact and movement of the foot- an exceptionally handy feature, when you consider the amount of legwork that gets put in at a construction site. This way, your feet take significantly less strain. Similarly, the insole is molded differently under the arches and pressure points, to provide more support, and at the impact points at heel and ball of the foot, for impact absorption and cushioning. The dual purpose hardware on top only makes lacing up the boot easier. Durability – Now this is an area, where the Timberland PRO Boondock reigns supreme. The boot itself is made of imported leather, specifically, waterproof leather with a special waterproof membrane layer. The membrane also helps add another strata of abrasion resistance to the already tough surface. The safety toe also has a rubber abrasion resistance cover, to increase the durability and the scratch resistance of the front of the boot. The outsole also has oil resistant traction. So any liquids that fall or come into contact with the surface of the boot will bead up and trickle down the boot. The heel is firm and rigid, but is constructed so that the boot itself has stability, but the front of the foot has enough flexibility to boost balance and ‘return’ from the ground, while walking. The midsole also gives additional cushioning, with a lightweight and sturdy packing in the middle. More than anything, though, the waterproofing stands out, because there’s going to be a hundred puddles to walk through, and no one wants to stand in damp socks all day. Final thoughts – With their waterproof leather, tight seaming and excellent finishing, these work boots score full marks on all functionality and appearance fronts. On the downside, there seem to be a lot of issues with their sizing, so it’s best to look at the fit carefully before ordering them. Also, the life of the boots decreases relative to how long they’ve been exposed to water. So that’s a definite consideration for people who stand for long times in waterlogged places. The Ariat Men’s Pull-on work boot is something you’d not associate right away with being a work boot, because mamma mia, they look way too good to be meant for sloshing through mud. You’d think that, but one tries on and you know, these babies stand up to the test. Comfort and Design – In the same price bracket as the Timberland PRO, the Ariat Men’s Pull-on work boot is similarly sourced. The boot is made of imported leather, with a hard but flexible rubber sole. The shaft extends almost ten inches from the arch. On first glance (or should I drawl, ‘first gander, ma’am,’) the boots like a very well detailed pair of cowboy boots, with the tops shaped into the distinctive peach cleft pattern. The boots have a round toe in a roper shape, and are styled straight up Western, with dual pulls on the shaft, and intricate patterns detailed with the logo on the counter. But it’s not all pretty stitching. At its core, this boot is sturdy. The sole and the body have an ATS MAX platform, that prevents the boot from twisting from the base, and adds cushioning from the sides. The torsional stability helps increase the grip of the boot, and in turn, of the wearer. Similarly on the outside, the outsole has a slip resistant and oil resistant coating, which eliminates any chance that liquids could decrease the impermeability of the boot- even slippery ones like oil. They come in four colors- distressed brown, army green, aged bark, and a combination of the latter two options. There’s also one feature lurking in the design that might come as a surprise- the pull-on. Yes, I know, it’s right in the name. But the pull-on feature has been shaped to make the boot legitimately -patented- slip on friendly, without sacrificing the sturdiness of the contoured rubber sole. It’s called the U-Turn friendly system, and puts a hidden panel at the back of the shaft, which lets the boot be pulled on with ease. Durability – Now, even though we focused so much on the Ariat Men’s Workhog’s design, it scores bigger marks in the durability department. From the outside in, the outsole is the trademark Duratread outsole, which is doubly oil resistant and slip resistant, so there’s no losing grip with these boots on your feet. The shank is broader than usual on work boots, which helps improve support for the forefoot, along with heel stabilizers, which add impact absorption for the foot, decreasing the fatigue the foot muscles have to take, a feature that comes in especially useful for people working long hours standing. The shock absorption is also reinforced by the midsole, which is EVA, and tripled by the gel cushioned footbed, which prevents stress focusing on the pressure points of the feet. All the way in and you reach the footbed, which again has moisture wicking properties, keeping your feet toasty and dry. 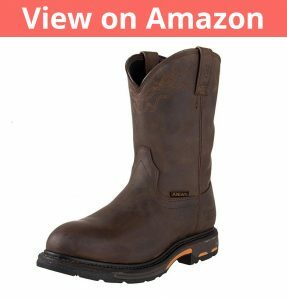 Final thoughts – The Workhog comes loaded with Ariat’s special abrasion resistant oil, and the boot has full grain leather with upper and lower Goodyear welting. To top it off, the outsole is also non-tracking. The verdict: These are shoes you can hold on to comfortably, for over a handful of years. However, the price is a little steeper than the average work boot, even though it does deliver on durability. Also, some people find the flexible section near the heel, that makes putting them on easier, uncomfortable over long periods of time. This one is a definite yes for people looking for major grip and unexpected style. If you don’t mind the price range, and the detailing on design (which you can avoid simply by getting it in the Distressed brown leather variant), this is the boot for you. 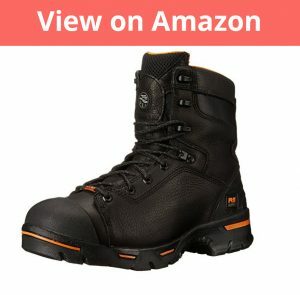 Best Steel Toe Boots ? First look: these are the work boots that scream, ‘work boots- for the classy man at work!’. The Thorogood American Heritage work boots are very aptly named. The premise of the boot is a hardy and tough work boot that still manages to look like it carries a bit of history, with its traditional color combinations and rounded front. If you’re looking for a work boot that doesn’t look like it was made to be caked in mud, this is your best choice. Comfort and design – While the Thorogood American Heritage work boot doesn’t have the intricate detailing of the Ariat work boot, it still catches the eye because of its classical design and color scheme. The most bought color is a rich chocolate brown with hints of oxblood, and contrast eggshell white stitching and detailing on the arches and seams, and a thin caramel stitch running parallel on the seam. Around the cap and the mock toe, it’s even more prominently marked. The boot itself is made of All-American made, soft oil tanned leather, with a Crepe sole. The shaft is about 6.5 inches high, so it’s reasonably tall. The front has ASTM rated steel toes, which hold their shape remarkably well against impact, but doesn’t add much to the weight of the boot at the same time. The inside of the boot has a nice, soft, cotton drill vamp lining, which provides some moisture wicking and adequate cushioning. The boot is Combo lasted, and has a Thorogood MAXwear Wedge outsole, which gives a strong, solid base to the boot, and adds impact resistance. The insole, on the other hand, is shock absorbing, so between the two, you have good padding for the foot and a firm step at the same time. The rest is made even softer with a Poron 4000 Cushion lining, and a composite shank which supports the base and ball of the foot. There’s a memory foam like padding inside the boot, which holds the toes extremely well, and the gel like lining under the ball and heel of the foot make it doubly comfortable. Durability – The Thorogood American Heritage work boot has a Goodyear storm welt construction and a solid thick outsole, both of which make for a remarkably sturdy boot. It has electrical hazard protection, and the steel toes add another layer of safety in the toe cap. Not to mention, the ankle support reinforcement is nothing to be sneezed at, either. Final thoughts – For the most part, most buyers consider this the ‘last boot they’ll ever buy’, not just because of the appearance, but also the value for the money. The average price range at $150-180 puts them in at cheaper than the Ariat or Timberland work boots, and still lower prices are available on some variants. While those are the advantages, the sizing and width need attention while buying. Also, the leather is prone to being punctured or chafed, so if you’re working in high friction environments, you need to weigh the benefits of buying this one. Overall, this is one boot that gets a definite ‘Buy!’. The second Timberland work boot on our list is not second to the Boondock by any stretch of imagination. The Timberland PRO Men’s Direct Attach falls into a much lower price bracket than the Boondock series, but still provides more than ample value for money. The Timberland PRO Direct Attach is completely seam sealed and waterproofed, making it a solid, one-piece boot for the hard working wearer. Comfort and Design – This unassuming looking boot is made of imported leather, and comes in four color variants- Wheat Nubuck, Brown Oiled Full Grain, Brown, and Black. The shaft is approximately 6 inches from the arch, and has a rubber sole. The front of the Timberland PRO Attach has a padded collar and hexagonal eyelets, with matching laces, and a logo embossed onto the counter. One look at the reinforced stitching on the seams shows you that this boot means business. The Direct Attach series is the ground up boot for Timberland. The outsoles are thick and rugged, and have ridging to increase the traction provided. While the leather itself is treated to be waterproof, the leather uppers are even more so because they are seam sealed, and help keep the feet dry. The waterproof coating on the outside makes any liquids that come in contact with the surface, or fall on the boot, simply bead up and trickle off. Another feature in play here is the PRO 24/7 comfort system, which maintains the arch of the foot during long work hours, without letting fatigue set in, especially at the pressure points. So if you have to regularly work for extended periods of time, this boot is a serious consideration for you. The other Timberland features are also prominent- Steel safety toe, electrical hazard protection, a padded top collar for extra cushioning. Add to all these, a special mesh lining on the inside, which has an anti-microbial treatment, for preventing odor development, and keeping your feet closed in, in a germ-free environment. Durability – The Timberland PRO Direct Attach is a solid work boot. It is especially decked out for long standing work, and designed with a contoured shock absorption plate to help disperse the strain of such work out over the rest of the foot, and prevent the pressure points from becoming sore or fatigued. Doubly waterproofed, seam sealed, Thermolite insulated, there’s no question on the comfort factor. One common point raised frequently seems to be that these boots are meant for frequent use. Just stashing them away without breaking the leather in, might damage the work boots’ surface. So if you need boots that you will wear only now and then, maybe reconsider with another Timberland boot instead. 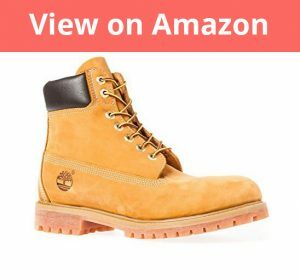 The clear advantages to these boots are the style and durability factors, so even if you do use your boots sparingly, there’s no reason to go beyond Timberland for these features. In simple words, these boots are straight up eye catching. So much so that people in search of a serious work boot might wonder, whether the slightly steeper price (in comparison to Danners or Timberland), but this boot is nothing if not value for money. Comfort and Design – The KEEN Utility Pittsburgh work boot is a creation of leather and fabric. Often people have issue with getting their boots wet, especially in frequently wet or damp conditions, and leather can’t just be washed now, can it. These hardy boots have a rubber sole and completely waterproofed upper zone, with an exceptionally praised lacing system. The laces stay tight and in place throughout the work day. The upper zone comes with rigid eyelets and a locking metal hook. The base of the boot has a contoured heel lock, providing an extra wall support. The footbed is surprisingly removable, and metatomical. The inside is lined with Dry-Lex footwear lining, and the outsole is thick and oil resistant. Phew, what next? The features just don’t end- which is understandable, for a boot with so much attention paid to design. The KEEN work boots are extremely high performance. The mid waterproof boots have a solidly shaped steel toe, which provides hearty protection against any lost or dropped heavy things headed towards your feet. The waterproofing- Dry – puts a membrane like cover on the boot, which keeps your boots safe from water damage, while still allowing for adequate air circulation. Now, the outsole on this baby is a bit of a special feature. The KEEN patented outsole wraps around the front of the shoe, in a signature pattern, and it’s not just decorative. The outsole helps add yet another layer of protection to the front of the boot, as well as one more level of waterproofing and impact absorption. From the inside, it’s contoured to be supportive for the arches of the foot. From the outside, it’s oil resistant and slip resistant. And despite the wraparound front, they are still wide enough to be comfortable even for men with wideset toes, who have trouble adjusting into a constricted or narrow boot. Durability – Despite the focus on design, this is where the value of the KEEN Utility Pittsburgh work boots comes in. These boots will chime in at a higher price than, say, the Timberland PRO series, but it is money well spent. These are boots that are going to stand the test of rain and snow, and last you many years. Final thoughts – The snazzy design of the KEEN Utility boots and their ruggedness definitely scores points. However, they are a little narrow in front, so people with wide set toes have more trouble breaking them in, which makes them uncomfortable for quite a while. If you have the budget to accommodate them, it’s a very big Yes to these boots. And here come the big guns! Danner work boots are synonymous with luxury and durability, the last shoe you’ll need to buy, the one that’s going to ruin you for other brands, and so on. Danner work boots, especially the Quarry USA Alloy Toe Work Boots, are highly preferred among people who have to prioritize for comfort at the work site. Comfort and design – The Danner Men’s Quarry Alloy Toe work boot is a well sculpted and smoothly molded shoe, made of American leather. The sole is actually Vibram, unlike other work boots, which are almost always made of rubber. The Vibram soles add another dimension of stability to the boots, in addition to extreme abrasion resistance, and can get a grip on almost anything between snow to woodchips. Not only does this increase the life of the outsole, but the durability and longevity of the boot itself is increased. The work boot comes up to about mid-calf from the arch, and have a solid steel toe in the front, that is rigid and almost completely puncture resistant. The color of the work boot is a rich black, with orange and caramel contrasting shoelaces, and embossed eaglet apertures. The boots are praised for their comfort anywhere between warm to freezing weathers, and have an Easy slide sculpting, to make wearing them even easier. The collar liner again is very soft, and the entire boot has triple stitching, to increase its resistance to wear and tear. In addition to the Vibram Quarry outsole, the Danner work boot has a midsole that’s made from a single piece, to give it more evenly distributed resilience and impact absorption. The boot is completely waterproof, and has GORETEX, but allows for air circulation nonetheless. The stitch down has Fiberglass Shank Danner increased endurance lining. Back again to the sole, the boot is oil and slip resistant, and is reasonably protective against electrical hazard as well, with Non-Conductive Electrical Shock Resistant Soles. The boots are extremely comfortable actually one of the most comfortable work boots I have worn, with no reports of chafing or blistering, from any customers including myself. Durability – Now, the Vibram sole speaks for itself, as far as the durability and long-lasting life of this boot is concerned. Apart from the Vibram outsole, the Danner work boots have a steel toe that is quite strong, and almost completely puncture resistant. If you’re okay with shelling out the extra dollars (when compared to other brands), this is the boot for you. Although you should remember that what you’re paying upfront, you still use, because these boots last way longer than more cheaply made one. The resistance and durability more than makes up for it. Even if you are intimidated by the price tag, this should still be a serious consideration for anyone looking for a serious work boot. Another Timberland on the list! And this one, with a wider price range, too. The Timberland PRO Men’s 95567 Endurance work boot is a heavy-duty work boot, especially crafted keeping men working long hours in mind. Comfort and Design– The shoe is ergonomically designed from the inside, to distribute the pressure from standing, onto the entire surface of the sole of the foot, rather than causing soreness and ‘impactedness’ at the pressure points. The tough leather shoe is made of, well, imported leather, and is about eight inches tall from the arch. The sole is made of rubber, and the insole is designed to be removable from the boot. The boots are waterproof, and reasonably water resistant as well. The anti-fatigue technology in the boots help to dissipate the strain of working hour after hour, and help keep your knee and back protected from injury as well. It is a solid, heavy boot, and can be taken off very easily. The price clocks in at a reasonable range, as affordable as other Timberland products. The steel toe appears a little ‘jutting out’, but from the inside, it’s not uncomfortable. It’s worth noting some people have reported to have developed calluses on their toes, which is more due to friction than anything else, and can easily be circumvented by picking up an appropriate size. It’s also well-padded from the inside, which just serve to make it even more comfortable, and handy in bad environments. Durability – while one would tend to be suspicious of the quality, this is one boot which delivers despite being way cheaper than the others. Even if you have to work in snow or slush, the sole is strong and gives great traction. Final thoughts – The sole on this boot is a work of wonder. It provides extremely good grip and traction. However, the boot is a little weak on the heel, and there have been reports of it unraveling around the heel. So if you’re working in very damp or waterlogged conditions, keep an eye on the waterproofing. Here’s a rainbow work boot for you! Okay, that’s just being whimsical, but finally, here’s a boot that has a gazillion color options, all the way from shades of Nubuck to Helcor, to Orange and Wheat. On first look, the Timberland Men’s Premium doesn’t even look like a work boot, rather like a sturdy boot that you ‘could’ also wear to work. In reality, the situation is completely the other way around. Comfort and Design – The Timberland Men’s Waterproof boot is a medium strength boot, when compared to the heavy-duty contenders on this list, but still holds its own. The boot is made from imported leather, very soft and somewhat burnished, and has a thick rubber sole. The shaft measures around 7.25 inches from the arch, and the heel is about 1.25 inches high. The boot itself has a platform height of 0.75 inches, and comes with a removable insole. Despite work boots’ penchant for being rough and tough, these boots have small attentions to detail that are positively dainty. The vamp is laced up, with a logo embossed on the side heel, and a nicely cushioned, padded collar. The boot opening is approximately 14.25 inches around, and comes with a whopping 400g of PRIMALOFT insulation, to pack the boot in nicely. Not only does that make the boot nice and warm, but your toasty feet also get superior cushioning and impact absorption. The Timberland creation is also waterproof, with a standard treatment that keeps the surface of the boot resistant to water accumulation. Water falling on the boot tends to bead up and fall off directly, instead. Durability– This is one of the oldest models from Timberland. Its legendary durability has kept it popular till date, even with the color and texture expansions. These boots will hold you through a couple of years of heavy on-site work, or many more years of simple wearing. Final thoughts – While these are the most standard boots anyone could hope to buy, one thing to consider is the sizing difference. The dimensions of the boot vary slightly, so it’s best to check the description carefully before buying them. Also, the leather creases easily, so they might need more care while storing, than your average chunky work boot. Some buying advice – if you’re buying them for fashion purposes, a big yes. If you need to spend a major chunk of every day on-site? You might consider a more heavy-duty Timberland boot. Here’s a maverick brand, in this Timberland dominated arena. 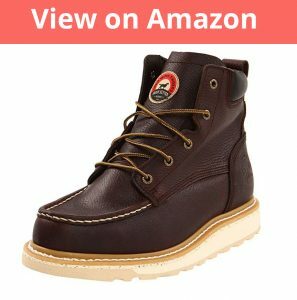 The Irish Setter Men’s 83605 work boots are cozy and almost chunky moccasin looking work boots, that fall within the medium price range, as far as heavy work boots are concerned. Comfort and design – The Irish Setter boots are eye-catching, with their dark chocolate brown, softly creased leather, and four light color detailing. The eggshell and cream white paneling add texture to the finishing, while the toffee colored laces offset both perfectly. Now, this is not a steel toe cap boot, rather a Mock-toe soft boot. Right there you can see that this isn’t a boot for mucky or weighty work. The boots have a rubber sole and the shaft measures about 5.5 inches from the arch. The boot opening is about 13.5 inches around, and has ribbing along the seam in front. The Briar Turbo Vegas leather used for these boots is made in Vietnam, and is full grain and waterproof. The footbed, rather than the insole, is made of polyurethane, and completely removable. The laces in front are traditional and slim, and the eyelets are metallic and patent. The sole has a Goodyear welt construction for increased grip and traction, and gives a firm, skid-free surface for the foot to base on. The midsole is EVA and gives the sole of the foot and the ankle joint, very good support. The White Rubber – EVA Traction Tred outsole adds an entire dimension to how stable this work boot is. Not only is it comfortable and cushioned, but also boasts a dependable grip on the ground. Durability – As far as medium to light weight usage goes, these boots are okay for a couple of years. They meet electrical hazard requirements and have a heat resistant outsole, resistant to a minimum or 475°F. The Goodyear treds add years to how long you can use the boot through damp and slushy weather conditions, too. Final thoughts – These boots are amazingly soft. The leather receives rave reviews for comfort and for fitting snugly. However, this is also a downfall, in a way, because the soft leather doesn’t allow the back of the boot to hold shape very well, and sometimes the heel digs into the back of the foot, consequently. 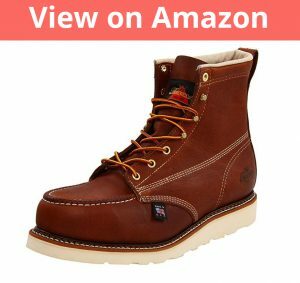 Some buying advice – For lightweight work and infrequent job site work, as well as work that doesn’t explicitly require steel toe boots, the Irish Setter boots are a good buy. 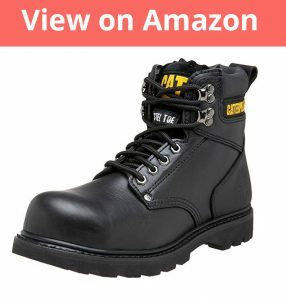 Best Work Boots for Men ? When you look at a picture of big boots in a children’s story book, these are the boots that you see. 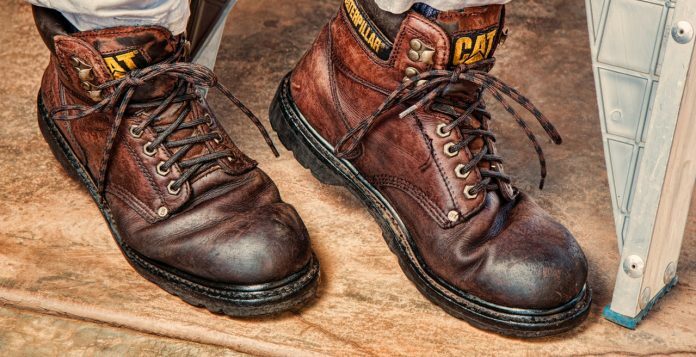 The name CAT is synonymous with worksite equipment and tools, and the Steel Toe boots are an extension of that efficacy. Comfort and Design – The Caterpillar Men’s Steel toe boots come in a basic black, and are made of imported leather, with a synthetic sole. The shaft of the boot is about 6 inches from the arch, with a platform all-around of about 0.75 inches, and a heel of 1.25 inches. These boots are a straight up, no-nonsense, ankle cut work boots, with padded ankles for extra comfort, a rugged and hardy full grain leather upper, and an oil resistant and slip resistant outsole. Unbelievably for this price, the sole is still tailored to provide maximum shock and impact absorption and give as much ‘return’ as possible, reducing the pressure on the soles of the feet and the ‘return’ straight to the heels. This helps keep the feet comfortable and prevents the legs from being sore even with long standing work. The boots also have Nylon mesh lining sock liner inside, from Climasphere, which keeps the moisture wicked and the inside of the boot dry. The midsole is rubber, with a Goodyear Welt construction for enhanced grip and traction, and a heavy steel toe in front that meets ASTM F2413-05. Durability – In addition to these features, the Caterpillar Steel Toe boots are also electrical hazard safe, and can survive on fast working worksites just as well as more expensive variants. They break in quickly enough and pay for themselves after a while, especially given how much they decrease the impact transmitted to your back and knee joints as well. Final thoughts – The boots have a great fit, and are extremely comfortable, except for the steel toe. People with wider set toes have trouble with the rigid steel toe, so it’s better to get the sizing just right while ordering it. 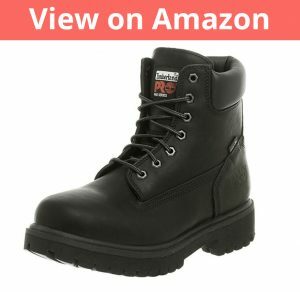 Otherwise, these boots are extremely cost effective and could even be considered the best steel toe work boots out there. Some buying advice – The cheapest in the list, and not deficient on features despite that. They do have an issue with overstretching, probably because they ‘break in’ so soon. The same goes for the laces, which may need to be replaced more often than with the other boots. Inspite of these things, these boots are a definite Buy. After reading all these, you’ve got to be scratching your head while staring at the options. Have no fear! Here are some main points you should ask yourself before you make a purchase. How often will you wear work boots? How long must you wear work boots, when you do wear them? Is the work you’re involved in medium exertion or heavy-duty work? Will your boots frequently be exposed to water? What’s your budget for the boots of daily use vs boots that you’re buying for ‘style’? What features are absolutely essential for you, in a work boot? These questions will help you narrow the list down to the kind of shoes that you need. More than anything else, though, work boots should be able to safely pull their own weight at the job site- And yours! Overall there are a host of things that you should consider when making the decision of what boots you decide to buy depending on your preference. Whether you are wanting boots that are more flexible and cheap more comfortable to wear boots for longer sessions or you are wanting more expensive boots that are made from leather than protect your feet, you are for sure bound to find something that suits you! Just always try and keep in mind a companies reputation and reviews of their products to get the best insight before you buy.